So, my family has dug graves for three generations now*. I’m sure if you skip back through the centuries there is a lot more grave digging going on down the family tree, probably with a peak around 1347 or so. Anyway, turns out this recent family business is a tad outside of the norm in the modern age- but it took me a long time to actually see it as that. Growing up all of us kids used to ride along with our dad and/or uncles on Saturdays for the grave digging jobs. I spent many a sunny summer day playing hide and seek among gravestones, and getting pushed into fresh dug graves by my brother. That part right there is a rite of passage in the family- getting stuck in a grave for an hour or so- ah childhood! We were taught to be respectful and to stay silent while the funeral itself was going on- and to be quiet and efficient in lowering caskets with the hand cranks after the grieving family had left. And we also learned that covering the grave dirt was important. I don’t know why actually- but there was always a big square of green astroturf to cover the grave dirt. Was it upsetting to the families to see? Never understood it, but never really thought about it either- it just was. I enjoyed old graveyards then and still enjoy wandering around them today. But they have to be old to be interesting; today’s headstones are the 70’s ranch house neighborhoods of graveyards- all the stones the same shape and size, just slightly different colors. Ugh. Give me the scary, head bowed angels, the statues of baskets of fruit draped in mourning cloth, the spires and obelisks, the huge crosses. The statues of tree trunks for monuments for the Woodsmen of the World… the taller the tree stump the higher up in rank the members were. The graves under huge oak trees. The ones with seashells covering the top. The tiny fences. 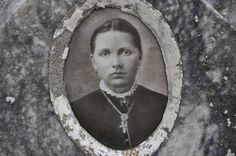 The photographs behind glass in the 1980s headstones have all faded in the sun or been water damaged- but the images from the 1890s somehow printed on white ceramic ovals are still pristine- photos of people dead over a century are clearer than those of people I could remember- if I had but known them. Those old ceramic photos (at least around this part of central Texas) are generally dour German immigrants. Little ovals of the wife on one side of the headstone and the husband on the other- glowering disapprovingly at all the generations that have followed them. Every once in a while there were exceptions though. 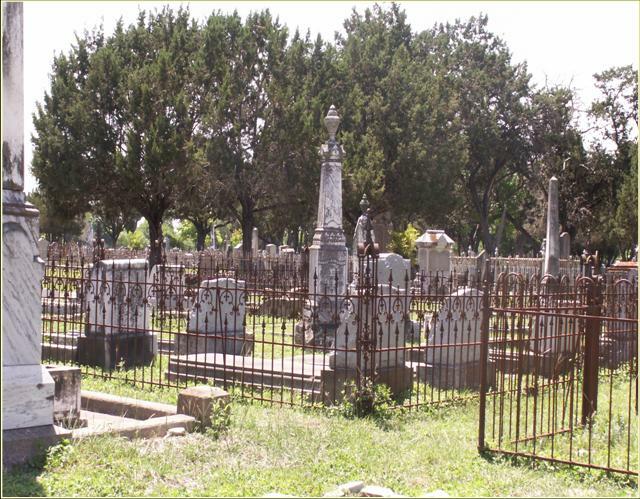 There is one grave in the old section of the Boerne cemetery where the image is of a husband and wife together… smiling and hugging. In the 1890s. How scandalous! And how they must have not cared- it was their death- they did what they wanted with it! It made me smile when I saw it. Proof of a happy marriage through the ages. In my travels as a salesman in South Texas I’ve taken a few lunches wandering old graveyards with a sandwich in my hand. Sometimes you need 30 minutes of just being outside,wandering under trees and not answering phone calls, you know? Weird, weird, weird- I know that too. But I’ve never minded graveyards or found them creepy. I try to put the words to the feeling I get from those really old ones. Death minus grief equals peace… that is the closest I can get to it- though it isn’t exactly right. And I guess the familiarity from my own past plays in there too. And I just found out this past week that my grandfathers slogan in the early days of his grave digging business was “We’ll be the last to let you down!” Which I find brilliant and would tell him so- if we as a family hadn’t dug his grave and already been the last to let him down. Oh well- he knew he was hilarious- he didn’t need me to tell him. *Pretty sure this makes me an Untouchable if we go by the caste system in India. Great story and beautifully told. He also said that “people were dying to get into his business” or that “business was so good people were dying to get to get in.” He also instilled an early acceptance of death, so much that is something that will always happen (and thus a good business). Agree with you about the uninteresting homogenous cemetaries…like the one where my grandparents are buried. And I am not creeped out by them, except at night! I like the photos in ceramic on the headstones, gives you more of an idea of the person, instead of just a name. Love your granddad’s slogan! Thanks, Ginger! I agree, the stones with just a name are just not enough… you want more of an idea of what that person was really like! Your grandfather’s slogan is hilarious! And what an interesting childhood. Fascinating stuff about the woodmen’s ranking too. Glad I decided to check out who was following my blog and found your posts! Thank you so much for stopping by- I’ve enjoyed your blog for a long time!